The ultimate guide to Chamrousse ski holidays. A cluster of three villages in a quiet spot of woodland above Grenoble, at the foot of the Belledonne mountains. Former host of the Winter Olympics, Chamrousse has some fantastic skiing for beginners and families - with a few gems thrown in for experts (this is where Jean-Claude Killy won his golds, after all). At the top of the spectacular Belledonne massif and just 30km up from Grenoble, Chamrousse has marvellous sights of the city one side and fantastic vistas of the mountains on the other. It’s best known for having hosted the 1968 Winter Olympic Games where Jean-Claude Killy earned his place in snow-sporting history by winning 3 golds. Holidays are good value here and thanks to the resort’s proximity to Grenoble, travel isn’t much of a hassle either. The resort is split into 3 villages sometimes known by their different altitudes – Recoin at 1650m, les Domaines de l’Arselle at 1700m and Roche Béranger up at 1750m. Recoin is the main hub where you’ll find liveliest bars and restaurants as well as the La Croix gondola, which takes you up to the Croix de Chamrousse summit at 2250m. Domaines de l’Arselle and Roche Béranger are often paired as one area and consist of mostly purpose built apartment blocks. There’s a good selection of bars in Roche Béranger which is home to Chamrousse’s fantastic Sunset Snowpark. These higher villages are terrific for families and beginners as they’re near five excellent green runs. All areas are linked by ski runs and a free shuttle bus service makes its way between them. Lower down you’ll find truly stunning woodlands for tree-lined skiing and Nordic skiing– keep an eye out for the mountain hare and black grouse which inhabit the area. The 90km of downhill slopes covered by 18 ski lifts is more than enough for most skiers. You’ll also find over 40km of cross-country skiing. A Chamrousse ski pass will grant you access to the entire resort area - cheaper beginner passes are available for novices who won’t need access to the whole area in their first few days. View our detailed Chamrousse snow forecast or snow report and see all live webcams, piste maps, road and travel maps and lift pass prices. For a picture of historic snow conditions see the snow depths month by month with our Chamrousse snow history. Book beginner or improver lessons with local English-speaking instructors for a fantastic introduction to the area - lessons are available from both of the villages, practising on friendly nursery slopes kitted out with conveyor lifts and rope tows. The button lift from 1750 Roche Béranger accesses some of the best beginner runs in this area; ski the Perche and divert via the Variante de la Perche until you’ve built some confidence. From La Croix de Chamrousse the smashing red Lacs Robert will take you a little further into the Belledonne mountain range where you can ski down to the snow-topped frozen lakes where ice diving takes place. There are some incredible Olympic black runs from the summit for experts – ski the legendary ‘Olympique H’ all the way down to the lowest skiable point of the area, ‘Casserousse’ at 1400m. Here you’ll also find some ungroomed slopes good for practising skiing powder in safety before heading into off-piste territory – book a private guide for the best introduction to the local back country. Night skiing is possible in February when they floodlight "Les Gaboureaux" for incredible sunset views skiing down the mountain. 1750 also features the Sunset Park where skiers and snowboarders can try out their freestyling – you’ll find a mix of features arranged to suit all abilities from beginners to pro’s. The “skicross” consists of banked turns, tables and waves, you can follow the tracks of Killy on the parallel slalom and there are also some little bumps and a mini boardercross for kids and first-timers to adjust to freestyling. L'Iceberg Café in 1750 is an ideal place for après drinks – kick back after a day on the slopes and have a game of pool or lounge with a cocktail. L'Embuscade is a friendly bar - warm up and try the homemade mulled wine on their terrace and the K-Dox puts on themed evenings with concerts and live DJs for dancing a mix of music into the night. In terms of restaurants on the slopes, stop off at La Salinière for one of their tasty omelettes at lunch time. No French ski holiday is complete until you’ve had a crêpe – grab one from the snack bar Le Grillon in 1650. For local delicacies you’ll find tasty grilled specialties in La Pierre Chaude and in 1750 there’s the lovely Le Chamroussien which serves up good old fondues and tartiflettes. Le Boucanier is a good Italian option if you fancy a pizza one evening. When you’re not strapped to your skis, there are some really unique activities to get up to in Chamrousse. At the foot of ‘Lacs Roberts’ on the other side of the mountain you can try ice diving in the lake for an experience like no other! Car fanatics might be interested in the Ice Driving circuit and there are plenty of traditional winter activities including ice skating, sledging, show shoeing, paragliding and dog sledding. Things to do indoors include serious pamper sessions at the Balcons de Recoin wellness centre and movie nights at the Allocine cinema. When is the best time to ski Chamrousse? The Chamrousse slopes peak at a very respectable altitude of 2255m and the snow history in previous years shows depths usually pick up in January and are at their greatest around February. The slopes are west/south-west facing which means they get a great dose of sunshine. If you’re planning on coming at the quietest time then look to book outside of the school holiday dates, but either way you should have a great time skiing here. Things might get a little slushy in the afternoons later on in the season, so wake up early to make use of the best conditions before retiring for an afternoon beer in the sunshine at Le Chalet des Neiges or L'Isatis. 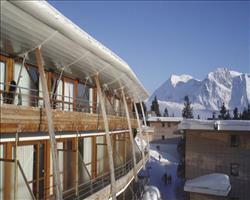 This is a popular resort for families with young children or families taking to the mountains for the first time. The ESF provide ski and snowboard tuition for all ages. Book the whole clan into group lessons to suit their age and ability and ski together in the afternoon, or opt for a private lesson where you can all learn with the same instructor. A great run to begin on is the Perche which goes back to 1750 – it’s easily accessible by the button lift if you’re staying at the Chamrousse Apartments. More experienced skiers and boarders can book freestyle lessons with AERO Style School, there’s a good selection of obstacles for beginners and pros at 1750’s Sunsetpark - you’ll also find a bag jump at 1650. If your children are too young to ski or haven’t taken to the slopes, Les Marmots nursery and daycare centre are open in the winter season to provide childcare for children from 3 months to 12 years old. The fun indoor and outdoor activities to keep them entertained while you’re out exploring the terrain. Quality family time isn’t confined to the piste - sunset sledging is available every afternoon from 4m (you usually have to make a reservation beforehand) and Draye Blanche offer dog sledding trips, that also need to be booked in advance - but are well worth it. Snowmobiling is also available with Espace Gliss (an adult has to drive but they usually permit passengers as young as 10). Most of our accommodation in Chamrousse is self catering, which can be ideal for families – cook all the favourites everyone loves back home in your own kitchenette and have a meal or two out if you fancy a night off (the Chamroussien does great pizzas). Browse what’s available below or call our ski specialists for expert advice, terrific deals and easy booking. Groups can ski Olympic terrain for cheap prices in Chamrousse as most of the accommodation is self-catering. The Chamrousse Apartments come in different sizes and can sleep up to 8. They’re located up in 1750 and most are practically ski in / ski out, so you can all get onto the slopes in record time in the morning. If everyone’s happy to chip in with the cooking and cleaning, you can all save some money – opt for easy to prepare, hearty meals that everyone will like and enjoy eating together in your own space. Self-catering doesn’t mean you have to cook for yourselves all week – spend a couple of nights eating out (some prefer to do so all week) in Chamrousse’s restaurants and cafes – the Chamroussien is a great option (also in 1750), run by a chap called Pascal who serves a tasty selection of mountain specialities, sandwiches and pizzas. Granted, the après ski isn’t extensive, but you can find some good places to drink if you know where to look (L'Embuscade is good for a chilled out winter warmer, K-Dox do some legendary themed nights and L'Iceberg Café is in 1750 if you’re staying in the apartments and want some après near your accommodation). In past years, the ticket office have offered an upgrade on the ski pass where for 10€ or so extra you can ice skate and access the Nordic ski area for free as well as getting a discount on cinema tickets, which can take care of some of your evening activities during the week.